The Tower of Voice memorial to the 40 passengers and crew of Flight 93. 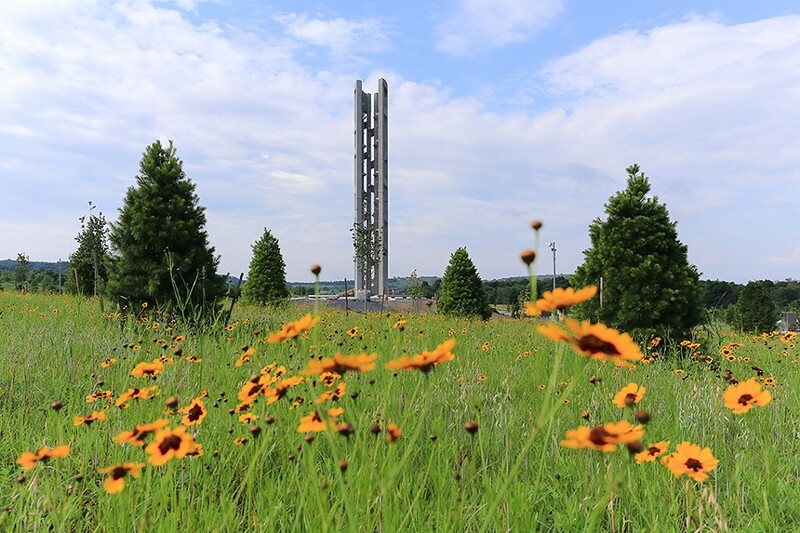 Encircled by trees and rising above a sprawling Pennsylvania meadow brimming with wild flowers, the 93-foot Tower of Voices is being dedicated today in memory of the 33 passengers and seven crew members who died aboard Flight 93 amid the terrorist attacks on Sept. 11, 2001. Each of them — including former Humboldt Bay National Wildlife Refuge Manager Richard Guadagno — are represented by the 40 wind chimes that cascade down the concrete memorial. The 10 a.m. ceremony will be live-streamed on the Friends of Flight 93 website, which can be found here. Guadagno, 38, is believed to have been among the passengers and crew who stormed the cockpit after hijackers took over the flight, bringing down the plane on an empty field rather than its intended target, thought to have been the U.S. Capitol. Seventeen years later, the pain of his loss is evident as Diqui LaPenta recalls their time together, her voice breaking with emotion as she talks about the man she knew and once thought she might marry. The two had begun dating in March of 2000 and although he liked to say the two met at Clam Beach, which she says is technically is true, that’s really where they saw each other for the first time after becoming acquainted via online personals. The plan had been to spend a couple of hours together, but later they decided to go out for brunch and she knew almost immediately their connection was special. “It was him in his truck in front of me and I saw him reach over and he kissed Raven and I was like, ‘I could love that man,'” LaPenta says. After that day, they were rarely apart. Soon they’d settled into a comfortable routine, making dinner together nearly every night, watching The Simpsons and spending the weekends with their cherished dogs. It wasn’t a rut, LaPenta emphasizes, they were simply happy. Then came Sept. 11. Guadagno had flown to his native New Jersey to celebrate his grandmother’s 100th birthday and was returning home on the early morning flight out of Newark. LaPenta says she is often asked if he called her from the plane. He didn’t. In fact, she says, he hated his cell phone. “In that situation, while I know he was thinking of me and his family, we were safe,” she says. Describing Guadagno as “a fierce defender of the environment,” she related a story about how he had come upon a man dumping the remnants of a meth-making operation on the grounds of the refuge he had managed in Oregon before moving to Humboldt County. Guadagno had been out for a run, clad in shorts without his badge or his gun, when he made the arrest. “He just did it,” LaPenta says. Few things, she notes, could make him angrier more quickly than someone who was harming the environment. While she describes him as a “homebody” who loved spending time in his A-frame home overlooking the bay, the grounds of which were dotted with some 200 trees that he planted himself, Guadagno also enjoyed entertaining. Guadagno was also a woodworker and a stained-glass artist. He built an electric violin, which LaPenta says she never heard him play, and had been in a band during his time in Oregon. LaPenta says she even has a cassette recording of him playing the Nutcracker Suite on acoustic guitar. “It’s pretty impressive,” she says. While LaPenta won’t be going out to the Tower of Voices dedication, she has been to the Flight 93 Memorial on two occasions and walked out on the field where the plane came to rest, the physical scars of the crash no longer evident on the landscape. On Sept. 11, LaPenta says she plans to go by the refuge that Guadagno loved so much to spend a few quiet moments in the memorial garden in front of the visitor’s center that now bears his name. LaPenta never doubted that Guadagno was among the passengers and crew who tried to take back control of the plane but, about a month after the crash, word came of a miraculous discovery that would cemented what was already a widely held belief among those who knew him. 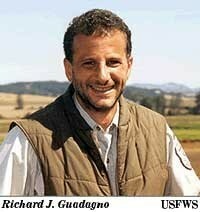 Guadagno's Fish and Wildlife Service badge — No. 1038 — was found amid the wreckage of the cockpit. It had apparently been suctioned out of the plane and deposited in a tree before being blown down in a wind storm, somehow surviving in near perfect condition. His family has donated the badge to the Flight 93 Memorial, where it sits on display. “In his mind, there wouldn’t have been anything else he could have done,” LaPenta says. Editor's note: Read the full story in next week's edition of the North Coast Journal.